The American economy stretches across the continent, and the trucking industry serves as a vital link between domestic and foreign trade. They move tons of freight from many locations and markets serving consumers with goods produced both at home and abroad. Without the efforts of truck drivers, our basic choices for consumer goods would reduce drastically in size. Truck Driving and Freight in the United States. 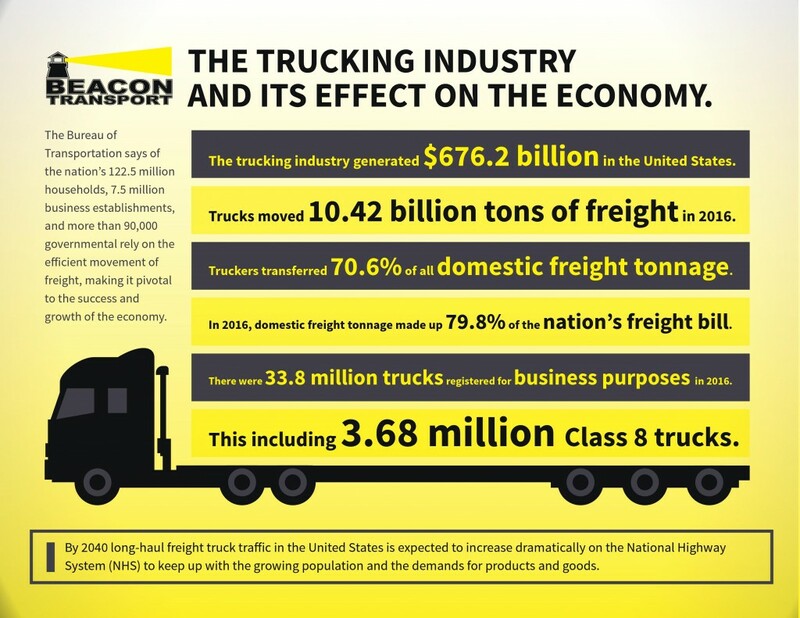 The trucking industry and its effect on the economy. The Bureau of Transportation says of the nation’s 122.5 million households, 7.5 million business establishments, and more than 90,000 governmental rely on the efficient movement of freight, making it pivotal to the success and growth of the economy. The trucking industry generated $676.2 billion in the United States. Trucks moved 10.42 billion tons of freight in 2016. Truckers transferred 70.6% of all domestic freight tonnage. In 2016, it made up 79.8% of the nation’s freight bill. There were 33.8 million trucks registered for business purposes, including 3.68 million Class 8 trucks. By 2040 long-haul freight truck traffic in the United States is expected to increase dramatically on the National Highway System (NHS) to keep up with the growing population and the demands for products and goods. The economy relies heavily on drivers to transport freight and keep supply chains moving. With the need for goods increasing, more truck drivers will be needed to help move domestic and foreign products. As households and businesses start spending more and with many of the current drivers expected to retire, the need for truckers is going to grow exponentially. 75 percent of American communities depend solely on truck drivers to deliver goods and services. 7.4 million Americans are employed in trucking-related jobs. 6% of those of truck drivers are women. Trucks burned 38.8 billion gallons of diesel fuel and 15.5 billion gallons of gasoline. In 2016 truck drivers traveled 450.4 billion miles. In 2011 nearly 14,530 miles of the NHS carried more than 8,500 trucks per day. That means on some stretches of road one in every 4 cars was a truck carrying freight. Because of the potential for traffic accidents, truck drivers have one of the highest rates of injuries and illnesses of all occupations. It’s not difficult for a truck driver to work 70 hours within 8 days, but the Federal Motor Carrier Safety Administration applies regulations to ensure each driver receives the appropriate time off in between deliveries for their own health and safety. Fun and interesting facts about trucks and their drivers that will surprise you. American truckers can travel as many as 200 billion miles in a single year. That total distance would take them to the sun and back 1,000 times. It takes approximately 55 feet for a large truck to flip a U-turn. There are approximately 5 million commercial trucks and 2 million semi-trucks in use in America. If you put each one end-to-end they would just about reach the moon. The average semi-truck’s engine is designed to last 1,000,000 miles compared to the 200,000 miles than a typical passenger car. Big rigs have an average of 10 forward gears and two reverse gear, but some have as many as 18! The semi-truck engine is about 6 times that size of one found in a passenger car. The average length of a semi-trailer without the cab is 53 feet, and with the cab is about 70 to 80 feet and can carry up to 80,000 pounds. 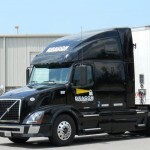 Are you ready to become a part of the next generation of truck drivers? Contact Beacon Transportation today.